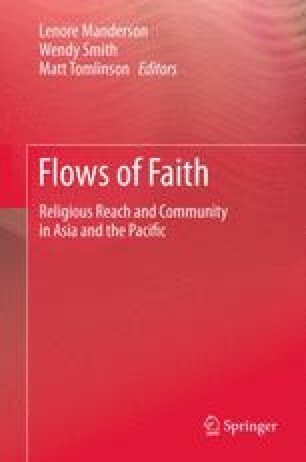 This chapter explores the transnational ties of a Christian evangelical religious movement called Deep Sea Canoe that is popular among Melanesian To’aibata speakers on the Island of Malaita, Solomon Islands. Solomon Islands is a Melanesian and pervasively Christian country in the Southwest Pacific that has a dynamic history of missionisation since the mid-nineteenth century and has seen the subsequent evolvement of a variety of ethno-religious movements. The example in this article illustrates a tendency of embracing modernity and the wider world through terms that are specific to To’abaita culture: pathmaking and straightening. By examining the present-day role of these terms in the ethno-theology of the Deep Sea Canoe Movement I will show that the urgency of millennial Christianity inclines To’abaitans to actively seek a straight path to Jerusalem instead of becoming recessive agents as documented for other Melanesian groups. Fieldwork for this paper was undertaken between December 2005 and March 2006, with the permission of the Ministry of Education, the Ministry of Foreign Affairs, and chiefs in North Malaita. I am particularly grateful to George Hoa’au, David Suata, Adam Ulufa’alu, Francis Iro, Steward, Lawrence Luiramo, Peter Kwanairara, Frank Daifa, and Terry Brown.